Sometimes it takes an earth-shattering event before you are able to truly appreciate something you haven't before, and the recent DVD release of Disney's first animated feature, "Snow White And The Seven Dwarfs," is evidence of that. What the studio has done in restoring their crown jewel of feature animation is one of the most astonishing things we will ever see, a sophisticated and informative remargining of one of cinema's most beloved movie fairy tales that doesn't simply present a restored classic as much as it re-energizes it. For years, countless critics and historians called the film an important landmark, citing both its technique and its storytelling as contributing factors to its status as a benchmark. They were right about the first part; the second, however, felt questionable. Though there was never any doubt that "Snow White" presented a very memorable story with colorful characters and imagination, parts of it felt unfinished and ambiguous, and certain players did not seem to attain the importance in the plot that they should have. Seeing the film for the first time in five years, however, completely restored and alongside countless bells and whistles, perhaps I was a little unfair in my initial judgment; in the long run, the minor quibbles don't matter as much as the fact that this was, undoubtedly the birth of a magnificent era in filmmaking. You know animation well. It's the genre that every child, big or small, leaps to when they long to escape from the sometimes troublesome world around them. It's the medium in which the journeys of the minds know no limits, and the place where ordinary beings can get sucked into a vortex filled with endless excitement and color. For many a generation, our moviegoers have taken part in a passionate affair for the feature cartoon, flocking to them like free money raids and coming away feeling enriched and satisfied. Who does not remember the moment when a blue fairy gave life to a wooden puppet, or the moment when a young deer prince took his first step? Products like these live long and fruitful lives in the back of our minds, existing as archetypes of joy that bring up our spirits when the world pulls us down. Trying to imagine life without feature animation is like trying to imagine culture without electricity or telephone; some things are essential. Taking those things into consideration—whether we want to or not—brings us directly to "Snow White," the lead reason, no doubt, animation became a success in the movie industry. At the time of its release in 1937, moviemaking was a relatively new enterprise with much to teach us; few filmmakers who enjoyed a challenge could clearly define what purpose the motion picture would have in the not-too-distant future. Walt Disney undoubtedly asked himself this question when his ideas began sprouting onto the movie camera; he experimented with several different ideas and techniques through cartoon shorts, trying to outline a clear path in which he could pursue higher ground for the future. The fact that most of his material utilized the art of animation made it even more difficult; many had played with different genres and tones by that point, but no one had ever tried to create the illusion of movie entertainment by using a series of hand drawings. When the Disney studios finally came out with the "Snow White" picture, the world was astonished. Suddenly the cinema made a leap it hadn't expected to happen for several more years. The level of artistic integrity in filmmaking was raised to new heights. And ultimately, and perhaps most importantly, it revitalized the notion that anything could be achieved in the movies, no matter how limited the technology at the time was. Outside the obvious, audiences also loved "Snow White" because it featured some of the most colorful, energetic and amusing characters we'd ever seen up to that point. 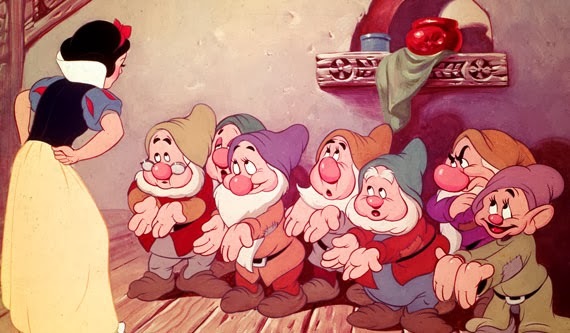 The Seven Dwarfs, for instance, were cheery and unique screen creations that stood out individually, as they were written using diverse human traits that many of us have been familiar with since the beginning of life. The Evil Queen, meanwhile, offered the perfect contrast to the lighthearted mood of the other featured players; her foreboding visage and mean-spirited attitude served as the fuel for the movie's need for a conflict, realistically representing that not all stories are always happy right up to the end. In that manner, the story itself was also well structured and paced, and by the end we felt we had experienced all the necessary emotions needed to create a pleasing payoff. But ultimately, is this movie better now than it was when I first saw it? Yes and no. The Disney studio has made a relentless (but successful) effort in restoring and improving the quality of the original visuals, but they have failed, needless to say, to make the movie's story as flawless as the art. Though the plot works regardless, the same painful questions that I had the first time around still distract me: why does the picture avoid using the prince beyond two scenes (one at the beginning and another at the end)? Why does Snow White lack nerve, unlike many later Disney heroines, past her relationship with the seven dwarfs? Why is it so important to the Evil Queen to be the "fairest" in the land, and furthermore, why doesn't she realize her transformation into a hag destroys her chances at being the most beautiful? Fairy tales have always left much up to the imagination, but even some things shouldn't go unanswered. No matter, though, because it's not simply the story that makes us so fond of "Snow White"—it's the notion that, without the film, there would be no greater animated efforts like "Pinocchio," "Fantasia" or "Bambi" to follow it. And besides, we are living in the era of DVD, an age where video buyers don't make purchases based simply on the quality of a movie, but of the quality of its supplemental features as well. And regardless of what you may think of Disney's very first animated feature, the bells and whistles offered on the DVD edition are the most extensive we have seen up to this point, undoubtedly pushing the envelope for digital video in the same way the movie itself did for animation over 60 years ago. "Snow White and the Seven Dwarfs" may not be the "fairest of them all," but being the very first of them all is reason enough to admire the effort.